You’re invited to the 2nd Annual ‘Slingshots Uncorked’ – a weekend event centered around the Lake Country Wine Festival. Join us for a Welcome Dinner BBQ at in the Conference Center of the Magnuson Hotel that’s fully sponsored for you courtesy of the Clarksville Economic Development Association and the Magnuson Hotel. 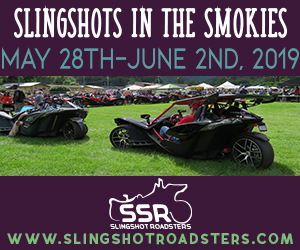 How to purchase: Email Sheila at director@kerrlake.com to confirm your attendance with the Slingshot Group and send a check to Clarksville Chamber, PO Box 1017, Clarksville, VA 23927. Mark “Early Bird Slingshots” on your check. Your tickets will be held at the “Will Call” tent for pick up the day of the event. Join us at the Flying Pig Ranch for a night of wrenching, sitting by the fire and telling lies. OK all you wine connoisseurs here you go! Joan and I will be there. Staying at the Magnuson. Bride and I are in. I'll start ringing phones ... People are more likely to sign up if they know that I will be there. It's parked next to a whine bottle and the driver is no where to be found? You have got that right @EjFord. That is what happens when you drive them instead of hauling the Slingshots around on a trailer. Please add your self to the participant list so we have you accounted for. Sorry @MACAWS I dont think we will be able to make it, as Ayla will be working to meet the Tax Deadline for her firm... Damn Taxes!! Bull$@#%! Take a look at the place we are going for brunch in Farmville on Sunday - might not be a very long ride if want to join us. I will arrange for a clean parking spot! Making plan to attend. Have a new tow rig to test out. Me and Cindy should be there. Need to work on some good lies. New rig?? Share the news! We're definitely planning for the Blues Festival again, though! Not yet. Got the vehicle. Trailer is about 30 days out.